Hello all! This is Lisa. It occurred to me to let you know that you are never alone. You are always surrounded by guides, angels, departed loved ones and other Heavenly Hosts. This is a sample of the energy around you. There are 5 beings and they are in your energy field for specific reasons. The color of the being corresponds with their energy, purpose or area of influence in your aura. Pink is usually love. The one pictured #4 above may be your grandmother, a favorite teacher or any other departed loved one. Blue may be speech, communication, creativity or any throat chakra distinction. Sometimes a loved one presents as blue because it is their favorite color or they loved to sing. Green is health, healing or any heart chakra distinction. This may also be a healing guide or departed loved one who has healed after death. Their color may be a message itself. This chart is only an example so I intentionally kept it simple. The one directly above your head is usually your main guide. The other beings may come and go but your main guide usually stays. You may also have departed pets in your energy field. The surprise is that they may be from previous lives and not a pet that you may immediately be familiar with. Your loved ones may also bring their favorite pet with them. There are so many possibilities of who may be near you and helping you at this time. #5 is depicted as a guide who has been with you but may be completing their time helping you and they are moving out of your energy field. 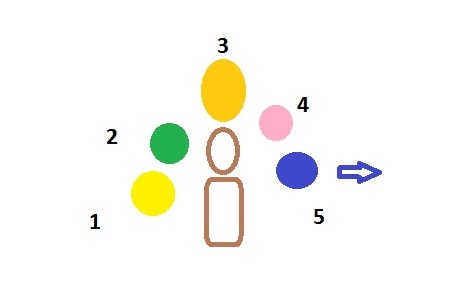 It is also possible to depict a guide who is newly entering your energy field as well. In that case I would draw the arrow coming in toward the person in the middle. They may present themselves as several smaller figures in a cluster. This may mean that the beings are related, providing the same or similar actions, have died together or closely, or perhaps a few generations of family members. Where they position themselves is also significant. To the right may depict your mother’s side and the left would be your father’s relation. Sometimes the right side is a person still here on earth and the left is someone who has passed. Sometimes they position themselves in a line. This usually means that the first being will act or deliver a message first then the next one will follow. This continues until all beings in the line have done what they came to you to do. I think that there is so much valuable information in a family portrait but I rarely get requests for them. Please know that you are not alone, ever. Do not get hung up on names. Likely the departed loved ones may be from a previous generation and unfairly focusing on a name may block you from getting the important message. Relax and receive what information God has made available to you. No one insists that you live your life without help. Every guide, angel and spirit has agreed to come to you and walk with you during this life. Be open and accept this love. This is a family portrait that I had done for myself some time ago. The purple beings help with my psychic abilities. Blue is communication and green is healing. I connect gold with God and other highly evolved beings. 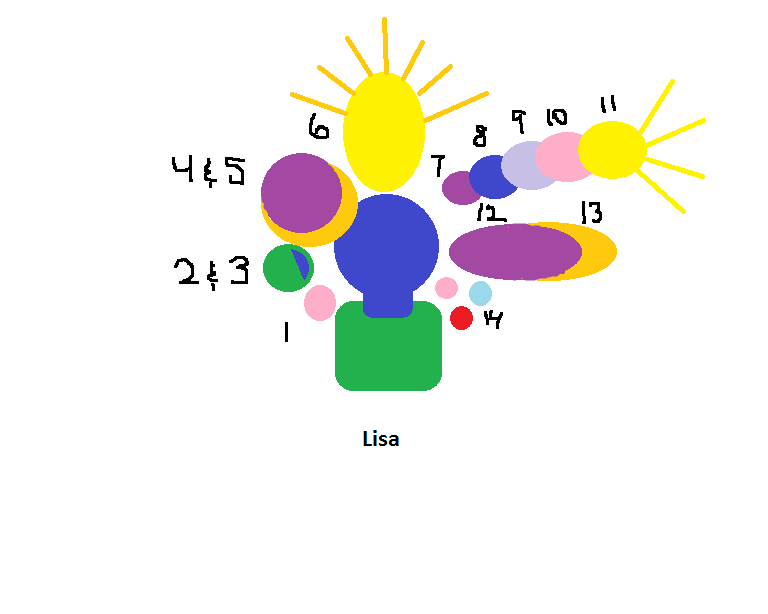 A chart is accompanied by a narrative which identifies the being by number and their purpose in your life. I won’t attach my narrative because it would be very lengthy. #1 is my mother and #8 is my father. Feel content with everyone who loves you and only wants the best for you. They are nearby just as they said they would be.